The Tokyo Photographic Art Museum carries out various projects/programs to discover artists with great potential who challenge the possibilities presented by photography and imagery, to offer support to their spirit of creativity, and provide a venue where they can give a free rein to their imaginations to further develop their creative endeavors. Central to this undertaking is the “Contemporary Japanese Photography” exhibition in which we present the works of several artists on a common theme that changes annually. 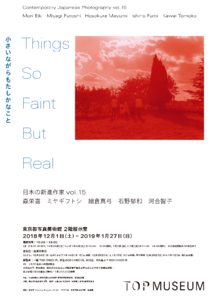 This year’s event is the 15th in the series and its theme is, ‘Things So Faint But Real’, featuring artists who use their sensitivity or personal points of view, identity or reality as a key to create new works. 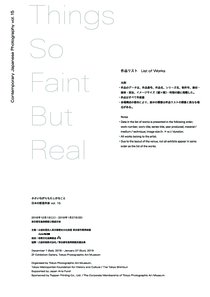 Unpredictable natural disasters, the increasing economic disparity, the delay in passing legislature to cover LGBT people, etc., the instability of the situation facing individuals and the difficulty in discovering certainties is the ‘real’ upon which the artists have based their works. Taken individually, these may not appear very large, but they provide us with the courage and hope to continue through these difficult times. In this exhibition we close in on ‘things so faint but real’, to each of the artists in order to explore their scope of expression. Born in Ishikawa prefecture. Graduated from the photography department of The New School’s Parsons School of Design in New York City in 2001. Received 39th Kimura Ihei Award for his photobook intimacy (Nanarokusha, 2013). His main solo exhibitions include “Family Regained” (KEN NAKAHASHI, 2017), etc. Born in Okinawa prefecture. Graduated from City University of New York in 2005. His main solo exhibitions include “How Many Nights” (Gallery Koyanagi, 2017), “American Boyfriend: Bodies of Water” (Kyoto City University of Arts Art Gallery @KCUA, 2014), etc. Born in Kyoto prefecture. Graduated from the literature department of Ritsumeikan University in 2002 and the Photography Department of the Nihon University College of Art in 2005. Her main solo exhibitions include “JJuubbiilleeee” (G/P gallery, 2017) and her main photobooks include Jubilee, (artbeat publishers, 2017) and KAWASAKI (CYZO, 2017), etc. Born in Hyogo prefecture. Graduated form Rochester Institute of Technology in 2012, and the Yale Graduate School of Arts and Sciences in 2014. In 2015 he received the ‘Japan Photo Award 2015’ and an honorable mention in the ‘Canon New Cosmos of Photography’. In 2017 he published his first photobook, Rowing a Tetrapod (MACK). Born in Aichi prefecture. Graduated from the Academy of Art University in 2001. In 2016 she visited Germany on the Agency for Cultural Affairs overseas study program for upcoming artists. Her main solo exhibitions include “On the Origin of Springs” (Künstlerhaus Bethanien, 2018) and “UTOPIA” (Gallery 916, 2014), etc. □Sponsored by the Corporate Membership of Tokyo Photographic Art Museum, Toppan Printing Co., Ltd.